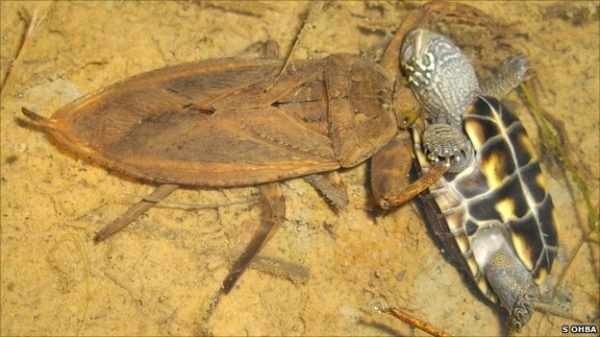 A giant water bug has been photographed eating a juvenile turtle in an unusual predatory role reversal. Dr Shin-ya Ohba recorded the unusual behaviour during night sampling in western Hyogo, central Japan. Writing in the journal Entomological Science, Dr Ohba describes observing a Kirkaldyia deyrolli eating a Reeve's pond turtle in a ditch next to a rice field. Using its front legs the giant water bug gripped the turtle, inserting its syringe-like rostrum into the prey's neck in order to feed.